Create a stunning display for the top of your (cheese) cake with these hand knitted mice. Each one is lovingly made from the finest lambswool and can be personalised with hand-embroidered initials or your wedding date, making them a wonderful memento of your special day. Mrs. 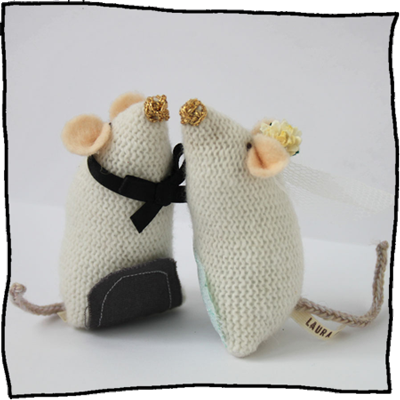 Mouse has a cream floral fabric tummy and a veil, while Mr. Mouse comes with a grey fabric tummy and a little bow tie. Both have hand stitched gold noses and are beautifully presented in a gift box. Dates are hand embroidered in white on Mr. Mouse or if you'd prefer to have your initials, they are embroidered onto each mouse in gold. Please use the box below to add your wedding date or let us know your initials for each of the mice. There is also an option to order two Mrs. Mouse or two Mr. Mouse. Dimensions: Each mouse is approx. 10cms tall. The price includes two mice.